By Thomas Joseph, Head Data Science at Quadrant 4 System Corporation. 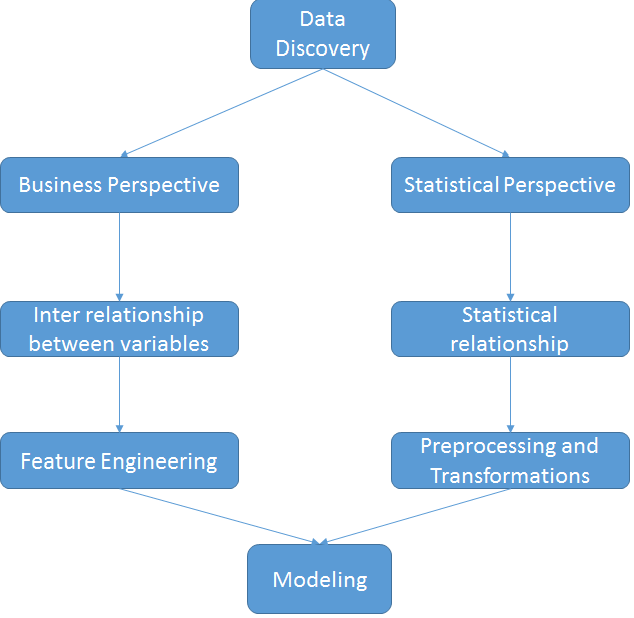 In the last post of this series we had a glimpse into the nuances of the business discovery and data engineering phases. These phases dealt with breaking down a business problem into the factors which influence the problem and collating data points related to the business problem. In this post, we will go further as to how the data we collected is further analysed to give us insights into our modeling process. This phase is called the data discovery phase. This phase is one of the most critical phases in the whole life cycle where one gets acclimatized with the data structure and the inter relationships between the variables. There are two perspectives as to how we approach the data discovery phase. One perspective is the business perspective and the second is the statistical perspective. Both these perspectives can be depicted as follows. The business perspective deals with relationship between the variables from the domain of the business problem. In contrast the statistical perspective will look more on the statistical characteristics of the data at hand like its distributions, normality,skew etc. To help us elucidate these concepts let us take a case study. Let us assume that a client of ours who have various cell sites approaches us with a problem they are grappling with. They would like to know in advance the state of health of the batteries which are powering their cell sites. They want our help in predicting when their batteries would fail. For this they have given us historical data related to the measurements they have taken over time. Some of the key variables involved are readings related to conductance, voltage, current, temperature, cell site location etc. Our client has also given us some clues as to what might constitute the failure of a battery. They have asked us to look at trends where the conductance values show precipitous fall over time which might be an indicator of failing batteries. Equipped with these information let us see how we can go about our task of data discovery. Let us first look at it from the business perspective. The best way to embark the data discovery phase is to think from the perspective of our business problem. Our business problem was to predict the impending failure of batteries. The obvious question which comes to our mind is what constitutes failure of batteries ? We might not have a clear cut recipe for failure at this point of time however what we have is a trail which we have to follow. The trail we have, is that of batteries which show a trend of dropping conductance over time. To follow this trail we need to first separate those batteries with falling trend from those which do not show that trend. The next question would be how do we separate out those batteries which have a falling trend from the rest ? The best way to do that is to go for some aggregating metric for the basic unit connected with our business problem. Let me elaborate the last sentence by going into a pictorial representation of our data set. Let the sample of the data we have at hand be as shown in the figure above. We have number of batteries, say around 20,000 of them. For each battery we have readings of conductance over a time period of around 2- 3 years. Each battery is associated with a plant ( cell location) . 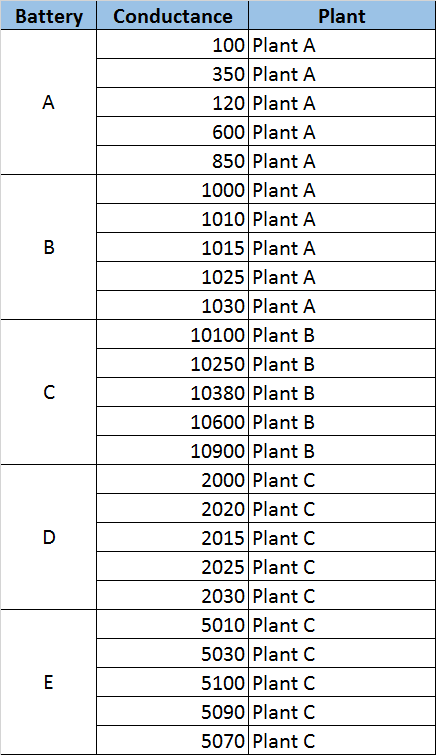 A plant may have multiple batteries however a battery will be associated with only one plant. Now that we have seen the structure of our data set let us come back to the earlier statement i.e. ” aggregating metric for the basic unit connected with the business problem“. Looking at this statement there are two main terms which are important.